Colour - white. Shape - oval. Easy to grow; eelworm resistance RO1. A popular early variety that is favoured for its tasty, white, waxy-fleshed tubers. New, boil, steam or saute - it does not discolour when cold. First Early. Quality Control - following inspection our seed potatoes receive a certification number (see bag label). They are size graded within riddle size 35mm x 60mm to achieve the ideal size, although shape will vary due to season and variety. A final visual examination takes place prior to packing. Note: a 1kg pack of a typical variety should contain over 10 tubers. Order Despatch - Potatoes are sent separately, in specially secure cartons, and will be despatched from December onwards, weather permitting. Please note that we monitor weather conditions daily during critical periods and do not despatch when frosty periods are forecast. All our seed potatoes are Safe Haven certified. Immediately upon arrival unpack your seed potatoes and keep them in trays in a light, airy, cool but frost free place for planting March/April. Plant into warm soil after the risk of frost has passed. Root development is best between 15 and 20ºC. Test by pushing your hand into loosened soil – if you can keep it there comfortably it is warm enough! 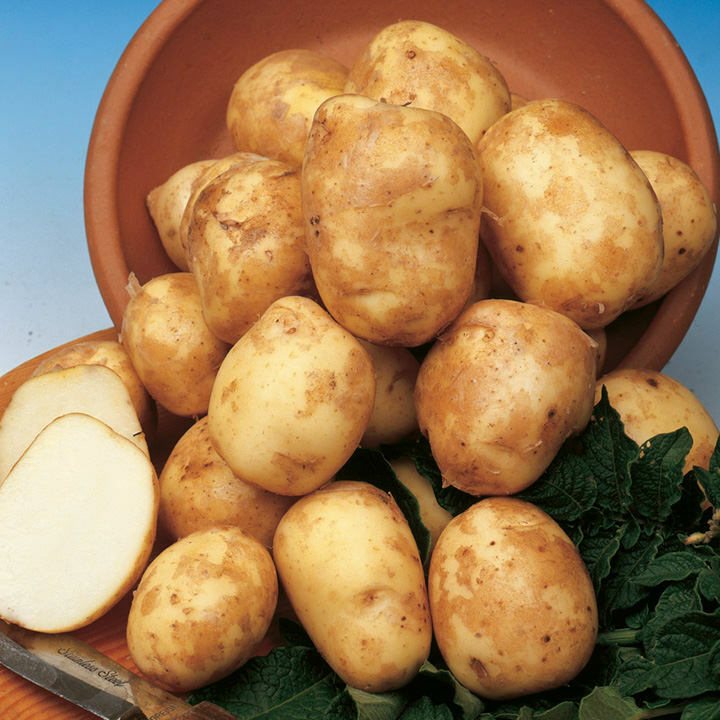 Chitting - If growing conditions are not suitable, seed potatoes which have started to sprout can be kept in good condition by placing them in a seed tray with the bud end uppermost to chit. Give maximum available exposure to light but protect from frost. A good chit is firm and green and will not knock off easily. Chitting speeds up growth and is particularly useful for encouraging the earliest possible crop but it does shorten the natural growing cycle at the end of the season. Planting Potatoes are easy! They will yield a worthwhile crop under a wide range of conditions. Traditional winter digging incorporating well-rotted farmyard manure and trenching in more manure or fertiliser in spring undoubtedly produces the best crop but is very hard work! Why not try for reasonable yields with less effort? Loams and light soils don’t need digging. Natural organic manures or composts can be placed in contact with the seed potatoes in a shallow trench. High potash chemical fertiliser can be placed on the surface after the tubers have been buried using a trowel or a bulb planter. A potato fertiliser can be raked into the soil during seed bed preparations. Plant early varieties 7–10cm (3–4") deep, 30cm (12") apart, and about 45cm (18") between rows. Second earlies generally need a little more space while main crop varieties are traditionally planted 37cm (15") apart with 67cm (27") between rows. Large varieties like King Edward benefit from even more room, up to 45cm (18") apart. Lightly fork between the rows to loosen the soil. If planting salads and you like a lot of smaller potatoes then plant closer together, only 25cm (10") apart. For high yielding maincrop potatoes a wider drill of approximately 75cm (30") will ensure minimal exposure to light and consequential greening. Growing - Earth up the rows 2 or 3 times using a rake or draw hoe before the foliage gets too extensive. This provides enough soil cover to prevent tuber greening and is very effective in controlling weeds. Water well in long dry spells this is especially important when the tubers are swelling. If you water 10 days after emergence when the tubers are forming you minimise the risk of blight. It is important not to over water. Harvesting - Earlies are ready 9–12 weeks from planting. Open flowers, if present, indicate that the first tubers are present underneath. Main crops take 14 weeks or more to mature. After natural die-back (or the removal of the foliage if blight has taken hold) leave the potatoes for 2–3 weeks in the ground to set firm skin ready for storage. As soon as skin is set lift the crop because the underground slugs are usually at their most active at the end of the season. The best test for size is to scrape away some soil. Start using when small for the delicious early potato flavour. Kids love small potatoes! You don't have enough space to grow potatoes? Did you know it's so easy to grow them on the patio?